Bits of My Own: Happy New Year Everyone! We will be having a quiet night here. We have never been big celebrators on New Year's Eve. Although we live just 25 miles from NYC, we will not be going to Times Square! Times Square is one of those thing you have to do once in your life, preferably when you are young and more oblivious to the cold! Keith and I still remember the year we went there. We were 18, just dating a few months, all those decades ago! I wish we had taken pictures. Now, I prefer to stay home by the fire and watch a good old movie! On the stitching front, I have made some progress with Freelove Hazard. She is coming along well, and hopefully I will have my first finish of 2013 before long. 2012 was a good year for finishes, 14 in all. Here they are (not in order). Don't forget to leave a comment if you would like an opportunity to stitch the Traveling Pattern (see last post). I will pick the winner on January 6th. However you celebrate, I wish you all a very Happy and Healthy New Year! Beautiful finishes this year. Freelove is coming along nicely. Happy New Year to you and your family. Such lovely finishes! I love Freelove! I have her waiting to be framed. Such fun that you and DH went to Times Square once upon a time! We've never done that, and have no desire to either. lolol! Happy New Year! Well done on all you have achieved in 2012. Wishing you and your family a wonderful 2013. You've had so many wonderful finishes. I love the Freelove sampler. So many wonderful finishes for the year! Have a great 2013! You had some great finishes in 2012. You finished lots of beautiful projects last year.... Seems weird saying that! Hapoy new year to you! Lots of beautiful finishes for the year! Freelove is almost there and looks lovely! I'd love a chance at the traveling pattern! 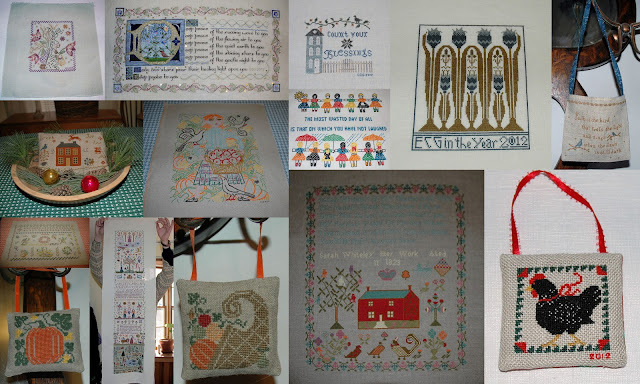 Great projects that you stitched last year. And I think the new stitching year will be just as successful as the old one according to your nice progress on your WIP. Freelove looks like she's coming along very well! Congratulations on all of your 2012 accomplishments! Happy new year to you and yours.